Gordon and Pat Peterson support Westmont because their son, Erik '87, had a great experience during his college years. Like his father, Erik attended law school and became an attorney. He and his family live in San Francisco. 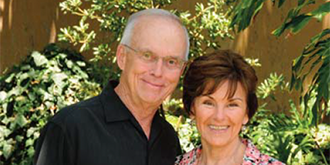 The Petersons decided to include Westmont as part of their legacy when Gordon was still working as an attorney. He understood the benefits of estate planning but wasn't sure which approach would yield the greatest benefits. So he listened to lawyers with expertise in the field and discovered he could realize substantial tax savings by designating some of his IRA funds for charities. "For us, naming Westmont as a beneficiary of one of our IRA accounts seemed to make a lot of sense," Gordon says. "When you give these funds to a qualified charity like Westmont, your estate pays no tax, and neither does the charity. But if you give that same money to your children, they will pay tax on it, and your estate may also." This decision qualified Gordon and Pat for membership in the Wallace Emerson Society. To name a charity as the beneficiary of an IRA account, you fill out a simple form provided by administrator of the IRA. You don't need to hire an attorney or change your will or trust. The Petersons, who celebrated their 58th wedding anniversary recently, base the charitable giving in their estate plan on their Christian values. "By supporting Westmont professors and students, we know we're fulfilling our obligation to evangelize and support the Great Commission while developing Christian leaders and helping others," they say. "Staying connected to the college as Wallace Emerson Society members also helps us know that Westmont is staying true to its mission." Reproduced with permission from the July 2014 issue of the Toward Tomorrow newsletter. For more information about naming Westmont as a beneficiary of your IRA or retirement plan, please contact the Office of Gift Planning at (805) 565-6058 or giftplanning@westmont.edu.